Why choose PTFE on hard anodising? Hard anodising has a lower coefficient of friction and higher wear resistance than the untreated aluminium substrate. Wear resistance can be further improved and coefficient of friction can be substantially reduced by the application of a dry film lubricant, such as PTFE, to the surface of unsealed or sealed hard anodising. In most cases hard anodising is left unsealed before the application of PTFE but it can be sealed for enhanced corrosion resistance or when a dyed coating is specified. Situations where low friction is required include moulds, threads and fasteners. Unsealed hard anodising has superior wear resistance compared to the sealed coating but sealing is crucial to corrosion resistance. Application of a suitable lubricant, such as PTFE, to an unsealed coating improves the corrosion resistance without reducing hardness of the coating. It has been estimated (Karl-Heinz, 1987) that losses to industries due to wear are approximately 1-2% GDP. There are therefore considerable economic and environmental savings to be made by reducing friction between moving parts. The discipline of tribology is concerned with the study of wear of solid surfaces. PTFE (polytetrafluoroethene) is a synthetic fluoropolymer with the lowest coefficient of friction of any known solid and the highest operating temperatures of the fluoropolymers. PTFE can be applied to the surface of hard anodising. It is a common misconception that PTFE impregnates the pores of the anodised coating but this is not possible due to the largest pore diameter of hard anodising being an order of magnitude smaller than the smallest particle size of PTFE. Due to it’s non-stick properties it is not a suitable surface for painting or applying stickers or labels to. The coefficient of static friction is a measure of how much two solid objects in contact with each other resist movement relative to each other. 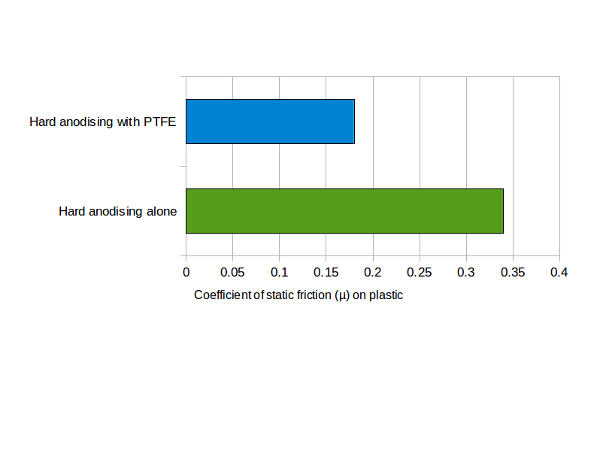 We have conducted trials which have shown a decrease in the static coefficient of friction (µ) on plastic from 0.34 for hard anodising alone to 0.18 for hard anodising with PTFE (see chart to right). One of our customers came to us looking for an alternative to using electroless nickel co-deposited with PTFE, as a non-stick coating for use at high temperatures. The nickel PTFE coating was performing well for them, however there are a number of issues with nickel that prompted them to look for a replacement. Nickel exposure, especially in industrial and occupational settings, can present significant health hazards. Nickel has been identified as a carcinogen and can cause dermatitis and sensitivity when in contact with skin. We recommended hard anodising with PTFE post-treatment as an alternative coating for their aluminium parts and conducted trials into the performance of this coating in comparison with their current coating. Our trials found that hard anodising with PTFE performed better than the electroless nickel coating, exhibiting a lower coefficient of friction, in addition to its other benefits of being inherently non-toxic and environmentally friendly. PTFE dispersions used on hard anodising are not necessarily suitable as food surfaces. In general, food surfaces should be hot water sealed hard anodising or non-stick food safe coatings on top of hard anodising. Please email us if you would like advice on PTFE on hard anodising. This page is just general suggestions and our specialists will be able to give more in depth information.